The Axial Seamount is an undersea volcano located 250 miles off the Oregon coast. It's one of the most active underwater volcanoes in the world, and it's just started erupting. For the first time ever, scientists saw that eruption coming. Could their technique help give early warning to people living in regions where volcanoes might suddenly erupt? Back in 2006, Bill Chadwick of Oregon State and Scott Nooner of Columbia predicted that an eruption at the Axial Seamount was imminent. They wrote that the eruption would occur before 2014. This initial forecast was the result of measuring the pressure of the surrounding seafloor, which indicated that the volcano was inflating in preparation for an eruption. It's the seamount's first eruption since 1998. In the aftermath of that eruption, the floor of the volcanic caldera dropped a whopping 10.5 feet, and since then it's been steadily rising back at a rate of six inches per year thanks to the accumulation of magma below the sea floor. The scientists figured it would be ready to blow by the time the caldera floor returned to roughly the levels of the 1998 eruption - hence the prediction that the volcano would blow by 2014. "Forecasting the eruption of most land volcanoes is normally very difficult at best and the behavior of most is complex and variable. We now have evidence, however, that Axial Seamount behaves in a more predictable way than many other volcanoes – likely due to its robust magma supply coupled with its thin crust, and its location on a mid-ocean ridge spreading center. 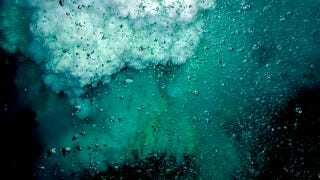 It is now the only volcano on the seafloor whose surface deformation has been continuously monitored throughout an entire eruption cycle." "It's funny. When we first arrived on the seafloor, we thought we were in the wrong place because it looked so completely different. We couldn't find our markers or monitoring instruments or other distinctive features on the bottom. Once we figured out that an eruption had happened, we were pretty excited. When eruptions like this occur, a huge amount of heat comes out of the seafloor, the chemistry of seafloor hot springs is changed, and pre-existing vent biological communities are destroyed and new ones form. Some species are only found right after eruptions, so it is a unique opportunity to study them. So far, it is hard to tell the full scope of the eruption because we discovered it near the end of the expedition. But it looks like it might be at least three times bigger than the 1998 eruption." "Volcanoes are notoriously difficult to forecast and much less is known about undersea volcanoes than those on land, so the ability to monitor Axial Seamount, and determine that it was on a path toward an impending eruption is pretty exciting...The acid test in science – whether or not you understand a process in nature – is to try to predict what will happen based on your observations. We have done this and it is extremely satisfying that we were successful. Now we can build on that knowledge and look to apply it to other undersea volcanoes – and perhaps even volcanoes on land." Via Oregon State University. Image of undersea volcano eruption via.